AILIHEN Sport Headphones Just $5.99! Down From $40! You are here: Home / Great Deals / Amazon Deals / AILIHEN Sport Headphones Just $5.99! Down From $40! 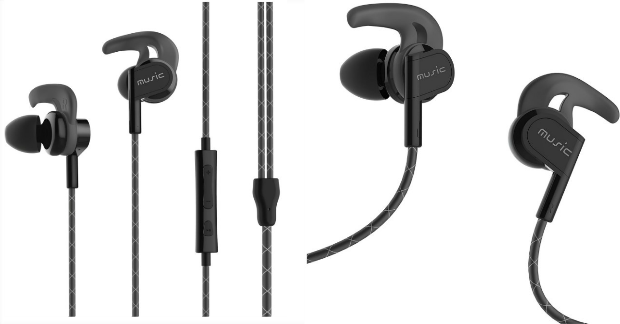 These highly rated AILIHEN Sport Headphones right now are just $11.98 down from $39.86! BUT WAIT! lol With code: KSJJW488 at checkout you get them for just $5.99! GREAT FOR WORKOUTS – The FreeSport SE1200 Headphones is specialized for sports use. The shark fin Fit eartips ensures the headphones stay secure in the ear while running, jogging, lifting or working out in the gym and provide extra hold to provide maximum freedom of movement. HANDS FREE CALLING – The inline remote and microphone let you control volume/track selection/voice applications for all Apple products, Androids devices or laptop – and take calls on your iPhone, Smartphones with one-touch ease. GREAT SOUND – High density housing makes sound quality clear minimizing unnecessary vibration and reducing diaphragm distortion . Good bass enhanced performance. CUSTOM FIT- Oval-shaped cable ensures a tangle free listening experiences. To ensure the best fit, comfort, and noise isolation, ergonomic fit ear piece (S/M/L) and spare shark fin Fit eartips allows users to be aware ambient noise while running. 10mm neodymium drivers pump out high performance sound, pushing you to perform at your best. A rubberized stability Shark Fin Fit eartips lock them in place when you put them in your ears so you need never worry about them dropping out. 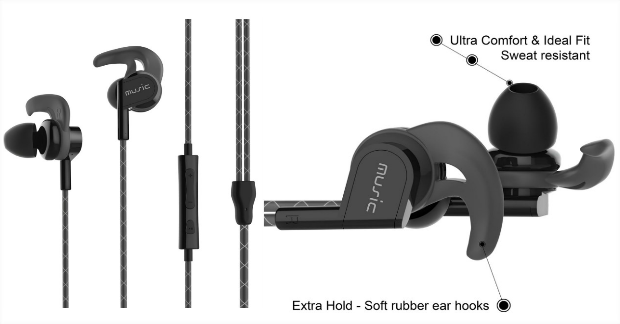 Ear piece (S/M/L) and spare Shark Fin Fit eartips allows users to be aware ambient noise while running.They also come with a cable clip for easily attaching them to clothing. Sweat or rain will no longer stop you from maxing yourself out to your favorite tunes. These Pivot fit sports headphones materials are sweat and water proof making them the perfect workout companion whatever the weather. Built in microphone allows you to answer calls without skipping a beat whilst the volume control allows for easy adjustability on the move.